Adding ringtones to iPhone X may present a challenge to new users. Fortunately, there are multiple ways to do this. Different methods of transferring ringtones to iPhone allow you to achieve this goal with or without iTunes. iMyFone TunesMate is an amazing tool that can help you add ringtones to your iPhone XR/XS/X/8 from your computer without using iTunes. It’s a convenient and fast method of adding ringtones to iPhone and is also recommended because it offers many additional advantages and features. Manage Ringtones: Customize your own ringtones; add, delete or share ringtones. 100% safe, fast, and convenient file transfer tool that supports all iOS devices. 1-Click media transfer feature, saving you time and effort while transferring all your missing files to iTunes. Relatively faster transfer speeds as compared to most other iOS media transferring methods. Two-way transfer feature to transfer your media between your iPhone and iTunes/computer, supporting all types of media files. Preview files before you transfer them. Step 1: First, download, install, and launch iMyFone TunesMate on your Windows PC or Mac if you haven’t done it already. Then connect your iPhone via USB and wait for it get detected by the software. 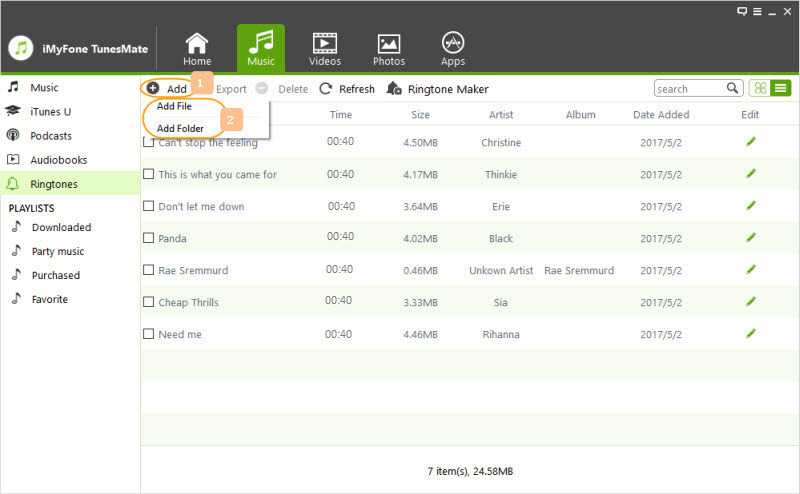 Step 2: Now navigate to the Music tab shown on the top of the interface of iMyFone TunesMate. And then select Ringtones option. Step 3: Click "Add > Add File and locate the ringtones on your computer. Select them for transferring. 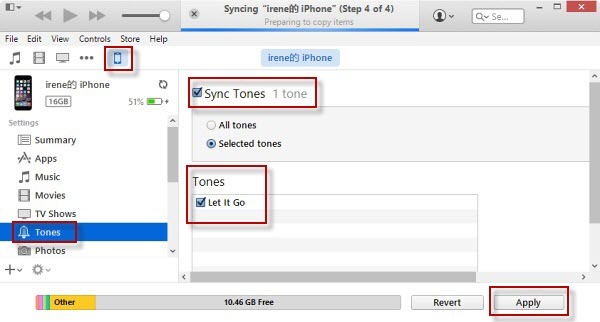 Once you confirm your action, iMyFone TunesMate will start transferring your selected music files to your iPhone. The added ringtones will automatically appear in the Ringtones section of the Settings App on your iPhone XR/XS/X/8. The process of adding ringtones to iPhone X/8 via iTunes is pretty straightforward because ringtones can be synced via iTunes just like all other media. Step 1: Connect your iPhone XR/XS/X/8 to your computer, it will be automatically detected by iTunes. Step 2: Now navigate to Tones section of iTunes. It is one of the tabs available at the top of software’s interface. Step 3: Now drag and drop ringtones from your computer’s hard disk to your iTunes library. Step 4: Click on the device tab at the upper left corner and select "Tones" from the left. Step 5: Check Sync Tones and select the tones. Click Apple to let it sync. Now you can disconnect your iPhone from your computer and enable the ringtones you have just synced. Your synced ringtones will be available in the ringtones section in the Settings App. Choose the ringtone you would like to use and you are done! There is one major risk of using this method; iTunes might erase your custom ringtones on iPhone that you have already added while syncing. iTunes can't extract ringtones from iPhone to your computer and share with your friends. 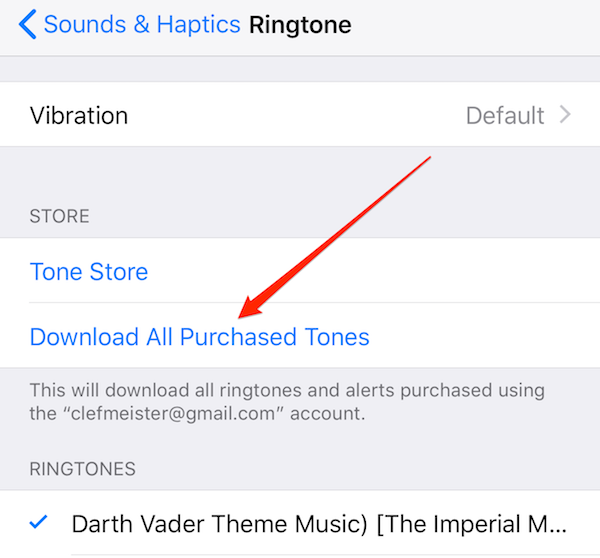 If you want to add your already purchased ringtones on your iPhone XR/XS/X/8, then you are in luck because iOS 11 has a new feature that allows you to do it very conveniently. Step 2: Navigate to Sounds section in the settings and then tap on any available sound in the provided list. Step 3: Now select Download All Purchased Tones option available at the top of the page. Doing this will start re-downloading your purchased ringtones and then make them available once the process is completed. Keep in mind that iOS will only download those ringtones that are available on iTunes Store. And if the owner has erased a ringtone from the Store, then you won’t be able to re-download it.